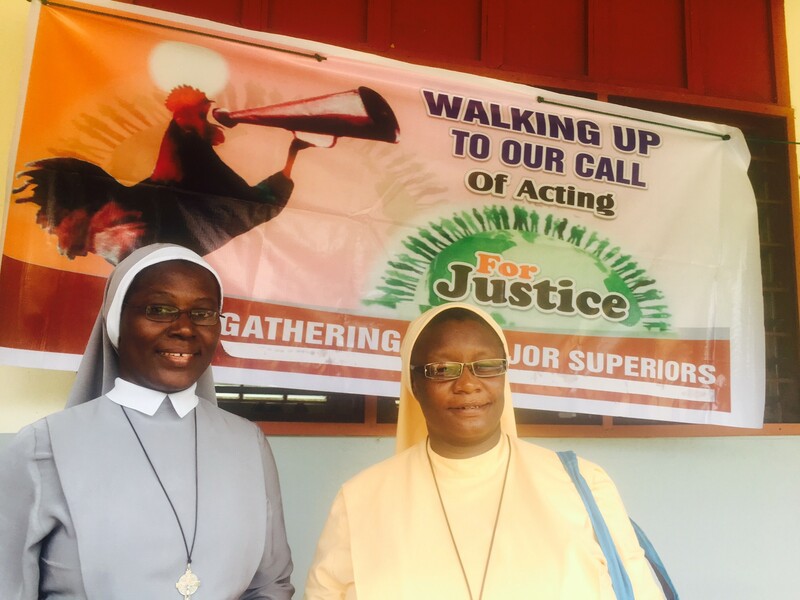 The African Faith and Justice Network (AFJN) secured financial support from Conrad N. Hilton Foundation to mobilize sisters in three African countries (Nigeria, Ghana, and Kenya) to engage issues of justice in their communities. 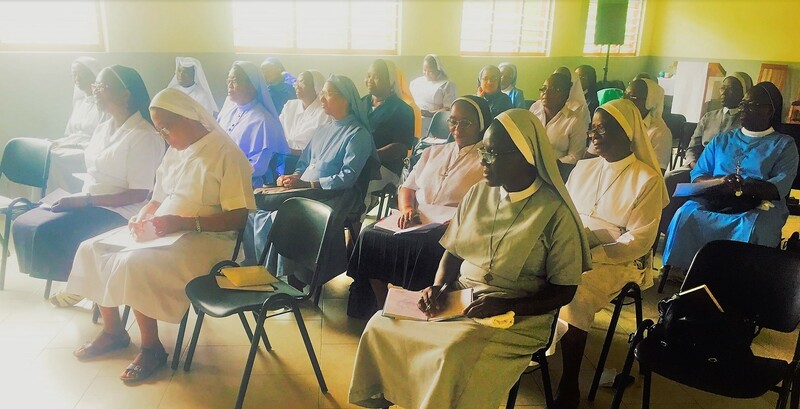 From May 13-16; we held a workshop with 30 major superiors of Ghana who convened at the Franciscan Valley of Prayer, Saltpond, Cape Coast, Central Region of Ghana. We intended that the conference, titled “Waking Up to Our Call of Acting for Justice” would (a) draw the attention of the superiors to recognize and respond to the call of the church to work to act on behalf of justice and to continue to support their sisters in their various ministries of service to God’s people, (b) help the sisters reflect on the current dynamic and consequences of social and economic injustice in their country, (c) direct the major superiors’ attention to the importance of sisters engaging in advocacy for social justice in the light of the gospel and the Catholic social justice tradition, and (d) solicit the informed support of their sisters for ongoing engagement in advocacy as they provide service to the people. The conference began on the evening of May 23 with the sisters welcoming the AFJN team in the Ghanaian tradition of presentation of a drink of water and then asking the guest to state their mission to the community. After the drinking of the water, we introduced ourselves and told the sisters about AFJN’s mission and desire to mobilize women religious in Ghana to actively engage unjust structures that continue to perpetuate poverty and dehumanize the people they serve. To further drive our mission home and to shape the thinking of the gathering, we told the sisters stories of African women fighting for justice, such as the Aba Women’s Protest of 1929 which mobilized against the colonial perception of women as taxable objects in Nigeria, the Women of Liberia Mass Action For Peace during the civil war when civil liberties were extremely limited, the Burkina Faso women’s spatula movement that helped put an end the dictatorship in 2015, and that of Fumilayo Ramson Kuti who organized market women in Abeokuta, Nigeria to dethrone an imposed leader. These are women who used their numerical strength and ability to mobilize around key justice issues and were successful in influencing change in their society. These stories excited the sisters. Even though some of them were hearing these particular stories for the first time, they spontaneously recalled and told similar accounts of compatriot women who spearheaded social change in Ghana. The energy generated by these stories indeed uplifted our spirits and gave us solid footing for launching into the crux of the conference the next day. We introduced the sisters to several governance challenges in Ghana as well as examples of the socioeconomic reality in their country, such as environmental problems caused by the use of toxic chemicals in mining and land grabbing and its negative effects on all, particularly on poor women and children. Other challenges such as the exploitation of people, extreme poverty throughout the country, and pervasive corruption were considered on the first full day of the conference. This led to animated discussions and the sharing of some experiences the sisters consider unjust or lacking in adequate response from the government. All their accounts pointed to constant and consistent exploitation of the body of the poor. With great pain in her voice, one sister shared how poor underage boys in the village where she lives flock to her community’s clinic, often without a penny in their pockets, contaminated by poison from unprotected mining practices in Ghana. Another sister told the story of a young boy who was dismembered by a family member, infuriated that the young boy wanted to go to school instead of farming. And another shared how she flew on her way to the Philippines with over 16 underage rural Ghanaian girls who told her that they were going to Dubai and Saudi Arabia to become “domestic servants.” These stories led the group to ask many questions that went unanswered: What is the government doing to protect these children? Who is allowing these girls to travel to an unknown country to work? What is going to happen to them when they get there? Who takes responsibility for the medical expenses of those young boys whose health has been compromised? Evidently, if these children are not protected by their government at home, how would a stranger care about their safety? The energy and anger generated by the sisters’ accounts of injustice led us to talk to them about the duties of the government, the civic responsibilities of the sisters as well as their role in ensuring a just society beyond their education, healthcare, faith education and other great service they render to the community. 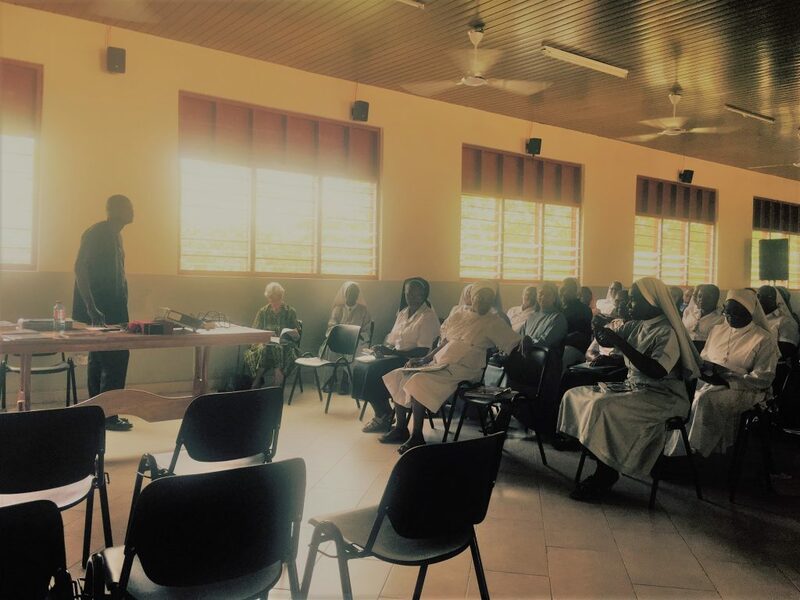 We led the sisters in a discussion on the concept of a fair society, the Catholic Church’s understanding of charity and justice, and the principles of Catholic social teachings as applied to current Ghanaian situations. Speaking on governance, one presenter, a Ghanaian himself, spoke to the sisters about the importance of their voice in shaping the affairs of the society. He also affirmed the mission of service of the sisters and urged them to speak up, for theirs is indeed an indisputable moral voice that the people have been waiting to hear at the national level. During his presentation, it was a delight to me to see the surprise and enchantment on the sisters’ faces, especially when the speaker kept affirming the sisters’ voice as being a strong voice with the potential to be more powerful than even that of the clerics in terms of creating social change, given the sisters’ closeness to the people they serve and their first-hand information about the people’s struggles. 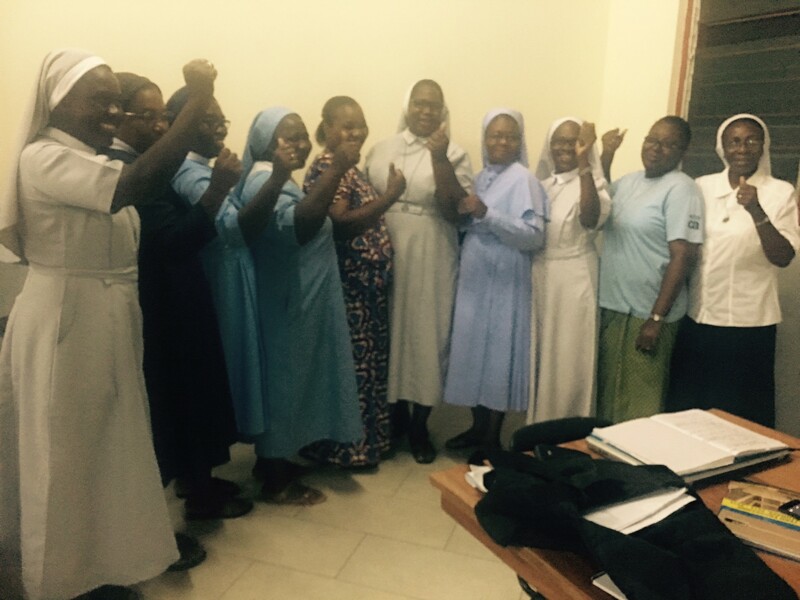 Following speakers and small group discussions, the sisters evaluated the mission of women religious in Ghana. In light of all that they had heard and based on current needs, they asked themselves, “How might women religious become more relevant in society?” The sisters affirmed their mission of service, rejoicing at what they are doing already doing: providing education, healthcare, and other social services to the Ghanaian people irrespective of tribe, religion, or race. They affirmed their courage in choosing to stand with the poor and the marginalized, able to provide emotional support to the most vulnerable in Ghana. Nevertheless, they acknowledged with great enthusiasm that “it is time for action now that they have been awakened to the structures of injustice and to their responsibility to act on behalf of justice. As a sign of their readiness to make their voice heard in the face of injustice, the sisters agreed to work together to tackle a perceived injustice imposed on them. This is the high immigration fee imposed on missionary sisters residing in Ghana and serving the people. The sisters felt that it is unjust that the missionary sisters who are here to serve the people are made to pay the same immigration fees as business owners and workers in the multinational companies who are in Ghana for a profit. The sisters set up a steering committee of nine sisters representing the sisters from different communities to plan a meeting with the president of Ghana. The purpose of the meeting being to explain to the president nature of the work done by Catholic sisters and to request that missionary sisters not charge the same immigration fees as foreign companies and workers in Ghana. The sisters also encouraged each other to pay more attention to the issues of trafficking and abuse of women and children in their different areas. They requested that the next workshop include this aspect of social ills in Ghana and also that the future workshop include other sisters, not just the major superiors. At the end of the conference, we felt that the major superiors were willing and ready to “wake up” to their responsibility to act on behalf of justice. We were joyous that the sisters welcomed us so well and allowed us to speak to their heart. We left Ghana happy because we were able to inspire them to action. We are eagerly looking forward to continuing our journey with our Ghanaian sisters in their struggle to ensure a fairer society for their people in October. We keep the sisters in our hearts and prayers that they may continue to find their voice in a society that longs to hear their voice in the public square.